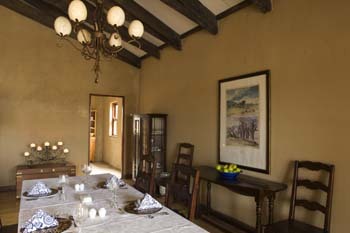 The Kalahari Manor is a private facility which can accommodate a maximum of 4 guests with the exclusive use of your own private chef, services and game ranger. 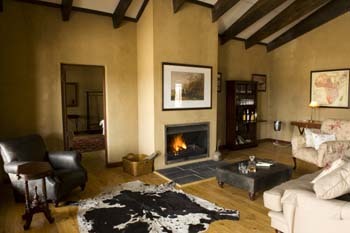 It is situated within walking distance of Deception Valley Lodge, yet totally secluded. The Kalahari Manor brings back memories of Colonial Africa with French doors leading from the rooms onto a shady veranda overlooking your own water hole. Here you can enjoy a traditional high tea, a refreshing gin and tonic or just savour the peace of the Kalahari as dusk falls. 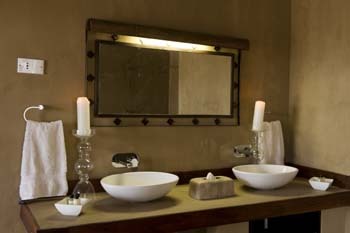 The 2 en-suite bedrooms (1 x Double Bedroom and 1 x Twin Bedroom) each has its own spacious en-suite bathroom designed to pamper guests with individual facilities for him and her. 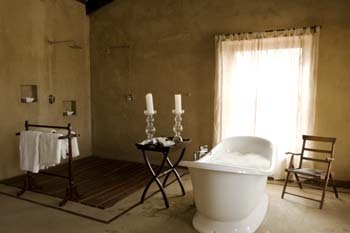 Two splash showers (his and hers) provide welcome refreshment in hot Kalahari days while the stylish and spacious bath relaxes and warms before a sumptuous dinner in front of the open fireplace. On balmy summer evenings meals are enjoyed under the African sky in a traditional boma area. On colder winter’s evening crystal, silver and bone china set the scene for a three course feast in front of the open fireplace. Brunch is usually enjoyed on the spacious veranda while steenbuck and kudu join the warthogs at the waterhole a short distance away. Manor cuisine is in keeping with the modern trend which fuses traditional flavours and ingredients with a modern style of cooking. Venison is a speciality although vegetarian dishes are imaginative and tasty. Kalahari Manor is a unique experience. 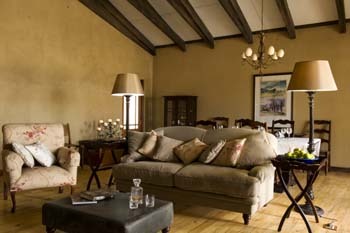 This private facility can accommodate a maximum of 4 guests with the exclusive service of your own butler, chef and game ranger. 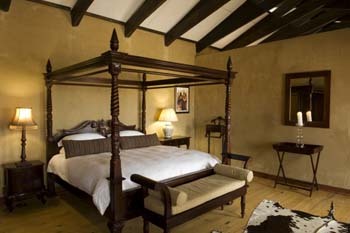 The manor brings back memories of Colonial Africa with French doors leading from all the rooms onto shady verandah overlooking your own water hole. Here you can enjoy a traditional high tea, a refreshing gin and tonic or just savour the stillness of the Kalahari as dusk falls. At The Kalahari Manor you can experience the vastness of the Kalahari while enjoying some of the most prolific bird life or do some star gazing at night. 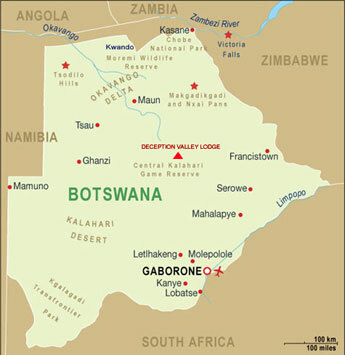 When outsiders think of the Kalahari, the image they generally have is the red sands of the Kgalagadi Transfrontier Park. But locals know it as a vast flatland of spectacular thunder-storms, old-fashioned villages, friendly folk and, when the rain comes, blizzards of butterflies. Here you can meet and explore this remarkable environment with bushman Guides of the San peoples, one of the oldest cultures in Africa. Experience a tour with real bushmen. Exploring the bush on foot, learning of the hunting and survival skills, the culture and crafts of the San people, who over the centuries have adapted their lives to survive in the most inhospitable environment of them all. Guided walks with the Bushmen to explore their culture, survival and hunting skills and their extraordinary knowledge of the veldt and animal life. Interact with the Bushmen of the Kalahari on one of the Cultural walks with Bushmen at Deception Valley Lodge. Specialized guided walks - survival of plant, animal and man in this arid semi desert. and if lucky, the elusive brown hyena. The night safari in particular will reveal a fascinating world of nocturnal species. Deception Valley is a bird lover's paradise. Enjoy the amazing Kalahari Sunsets while having sun-downers on Safaris or Walks.